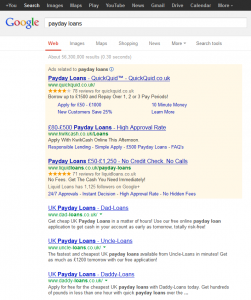 I have recently been keeping a tab on Google page 1 results for “Payday Loans” – a search term historically showing results of websites ranking having used spammy, dodgy and/or underhand link building techniques. 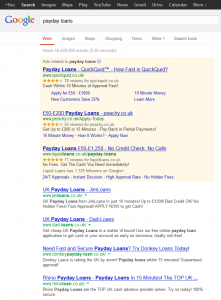 Even in the year 2013 – more than 12 months after the Google Penguin algorithm update was rolled out for the first time, the results for “Payday loans” still provide a surprise for your average ethical SEO. Take a look at the results of this screen grab from Friday 10 May. And here’s what I mean by a “surprise”. 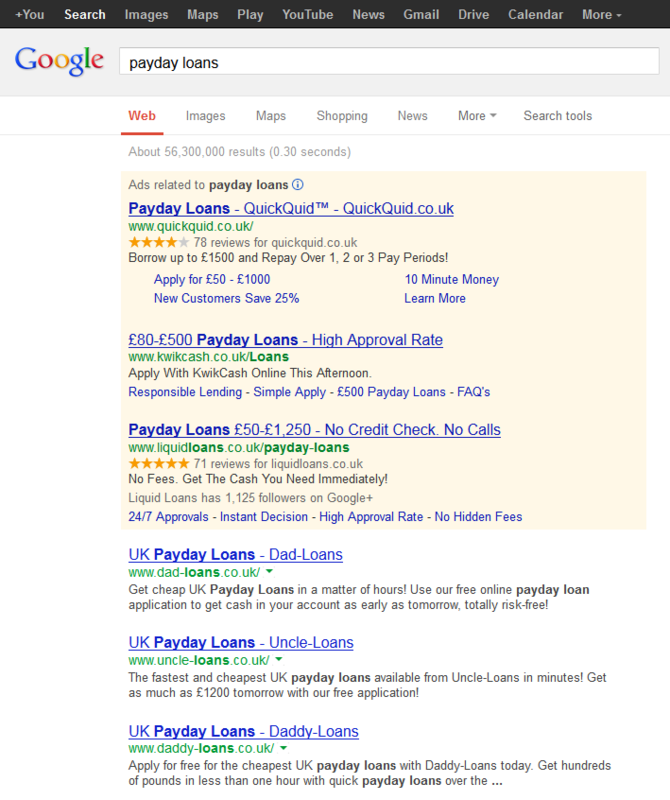 I clicked on all 10 results and 9 of them were affiliates redirecting to payday lenders (the only payday company that was on page 1 was PaydayUK.co.uk – not a client of mine I may add). But seriously, the screen shot doesn’t lie: home page affiliate redirects ranking on page 1 of Google – something that used to be rife in Google, but very rarely seen these days. 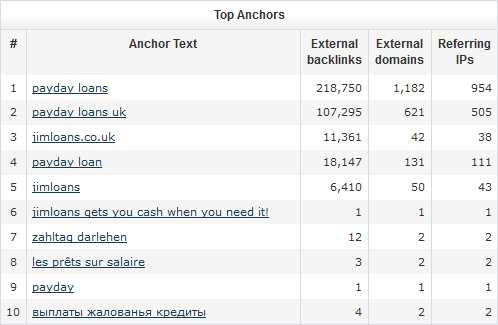 Initially, I was more interested in what JimLoans.co.uk was doing to get to number 1. So I created a backlink report with Majestic SEO. This immediately raised an alarm in my head: sitewide links – thousands of them. In all, there were thousands of links from non-related websites. But how did this website get to number 1? It’s difficult to determine. However, the more backlink profiles I checked of the sites ranking on page 1 showed that all of the results were building similar, non-related spam links. Perhaps the whole industry is just full of low quality backlink profiles that Google has no other choice but to rank websites with low quality links such JimLoans.co.uk. This tactic has worked for years: build a mass load of links in a short period of time to get to the top of Google. But Google has grown wise; once Google realises those links are of low quality, you get booted. And generally, you get found out and booted much quicker these days. 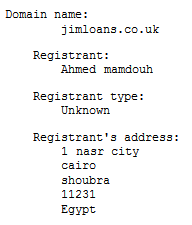 This case was no different; I certainly wasn’t expecting JimLoans.co.uk to last long in the results. And by Monday, the site was booted out. 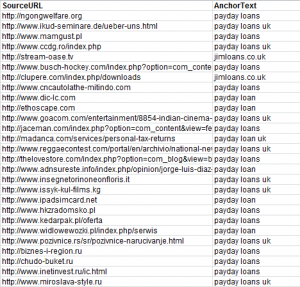 JimLoans.co.uk, a site ranking for “payday loans”, and with “payday loans” anchor text (and related terms) was not related to the fashion, entertainment and ice hockey industries, that were providing inbound links, amongst many other unrelated topics. 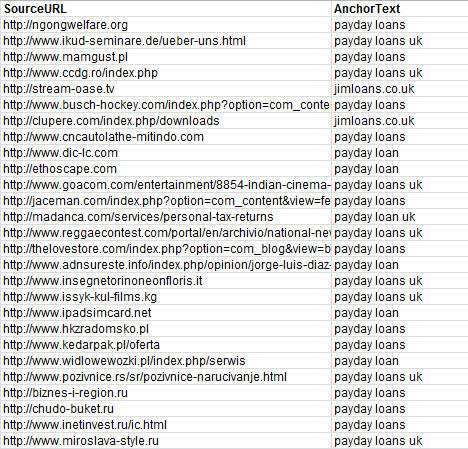 On top of this, all of the links I checked pointing to JimLoans.co.uk appeared to have been attained by hacking. The person responsible had been able to gain access to these sites in a short period of time and change them en masse. Changes made were only visible in the HTML and not on the page itself, so Google was able to detect the links but there was no guarantee that the webmaster’s of hacked sites could easily identify them. The website was benefiting from these links, ranking number 1 for at least a few days for a highly-searched term according to Google Keyword Tool (201,000 monthly searches), and potentially a big money making keyword. Those registration details were the same for the sites in 2nd and 8th positions too. This person had temporarily taken control of the top two positions for “payday loans” in the UK, for a few days. The top two terms had been a success – ranking number 1 in the short term for both “payday loans” and “payday loans uk”. Perhaps the brand name mentions were a shameful attempt at trying to stick to the modern day ethical SEO’s guidelines of building brand name links, whilst three of the bottom four keywords were “payday loans” in German (zahltag darlehen), French (les prêts sur salaire) and Russian (выплаты жалованья кредиты) respectively. I had a look into the link building tactics employed for these sites, and to no surprise they were all similar to the site that was originally at the top. It was only a matter of time before these sites too were eliminated from Google’s results. And indeed, on Wednesday they had all gone. Google’s algorithm not so perfect? Two weeks on from this, and 7 of the top 10 results are still sites that redirect as soon as you click on them (affiliates). The top two results at least are actual companies. So Google still has a lot of work to do in cleaning out its results. The initial Google Penguin algorithm update certainly did a lot of “good” in my eyes – clearing out lots and lots of junk and websites that were ranking for black hat techniques. The result saw the average marketer work a little harder for those links, stopping them from using tactics such as paying $5 a time for them, or paying someone abroad for a cheap, low quality article to publish on an article directory. 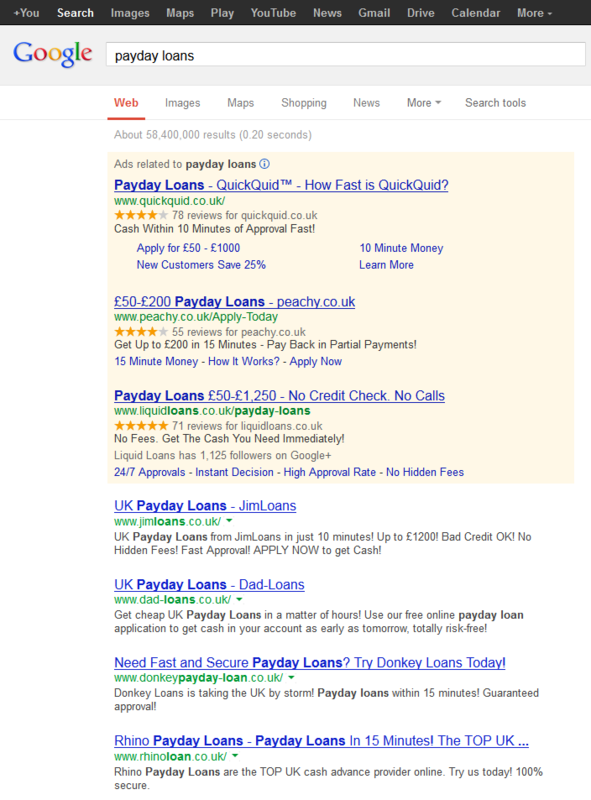 But one wonders – if the results for “payday loans” are this messy, what other keywords display similar results? If you want short-term success like Mr Mamdou then you can replicate his tactics and hope that you slip through Google’s security and rank number 1 for a short period of time. In the process, being unethical, breaking the law (hacking is illegal) and only making money for a very short period of time. Or you can produce an ethical link building campaign which will benefit your website and your business for the long run. Staying on page 1, hopefully position 1 for a long period of time, whilst the rest of your competitors fall foul of a Google penalty. Barrie is a link building guru at Receptional Ltd - with more than 8 years of experience in the digital marketing industry.A daily user of Majestic SEO. It is not ALL negativity from them. Google has also said they plan to give a positive boost for authorities in the future – so not all negative. Matt Cutts recently named this vertical in particular in the UK as one in which they plan to get involved in unravelling the problem. He said this in his video of mid May. > very good point, and not many look at it this way even though google has stated it. We normally speak about algo updates punishing sites. There’s rarely talk of an algo update rewarding site for quality practices. I did some research into this guy’s sites and found that he was gaining links from link spam that he put inside joomla plugins. He changes the links once the site gets penalized and ranks again with a new domain. I’m not in the niche myself, I just regularly look at the link building tactics used. Wait, all of his rankings still stayed after the latest update the other week? Its textbook spam tactics just by looking at his profile, and you pointed that out. 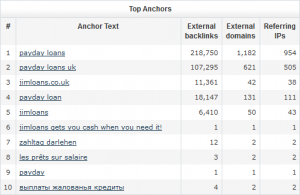 I mean even in 2013 his anchor text usage was so high I am surprised he was even ranking for his keywords… despite the alarming amount of backlinks. Google has evolved to detect those low quality links in Australia. I can see a bunch of high competition keywords are showing high traffic/authority sites on the result pages after the Penguin 2.0 update. It looks like Penguin 2.0 gave more credits to those well-known big brands in the industry. Great analysis. Interesting to see Jim is no longer in the top ten! I quite often see sites using similar tactics ranking highly, sometimes for a short period, but sometimes for even longer. Payday Loans is hugely competitive and results can change hourly – for other less competitive terms, I see these types of sites ranking for longer periods. I guess in an algorithmic sense, weight is given to these links, especially if some of the links have some form of built up authority. I do wonder why it seems to rank so highly initially. I think we can learn a lot of spammers. Not the illegal stuff, but what works and does not. the sort of spammer i find most interesting is the one that pops out of nowhere, ranks in a competitive keyword or group of keywords and then holds that ranking for more than 3 or 4 weeks. SEO sounds simple, but its very complicated especially with so many players willing to go some extra miles just to achieve their goals. I’ve wondered how some of these sites got their ranking. Interesting article on some of the practices being used. If you’re building your business for the long term, then providing quality, authenticity & being trustworthy is what will see you grow and rank your site. Great case study… I can’t believe that this happened very sneaky stuff and hat off to the guy who managed to perform this for a short term :). But even after the Penguin 2.0 Google will eventually close the gap to all these short term illegal/spammy tactics in search. Hate it when people who these tactics and somehow manage to get away still with it. Not for long hopefully. These guys all use black hat in a moderately, just enough to get them to page one but stay out of Googles radar. The rest of us, doing seo the right way may in the long run come up winning, but, in the mean time – stay behind. I love a good backlink case study! That was so much work for him for such a short time in the sun. It just doesn’t seem profitable in the long term – further evidence that it’s so much better to stay the course and make improvements to your site along and along. This was also a good introduction to how to use Majestic SEO for us newbies, so thanks! Reading the post and the answers I can conclude that Google is racist in a sense whereby some webmasters are penalized very heftily in certain countries, they are let go in others. Am I right in this point? Do their animals crawl certain advanced countries before other? Why? To be honest – they did not need to read this post – they were already on it. White Hat SEO is all I believe in, to be honest. I know that many people say “Come on, you can’t promote your site with WHS, forget it!”, but it’s not true. All you have to do is workk hard and play fair. Very interesting article. I don’t think you can do such tactics for serious clients. It’s really just for affiliates who don’t care for long term results. Very interesting research. SEO sounds simple but it’s the most challenging when all of your competitors- everybody fights for the same top rank. Always better to go slow naturally. I think it is easier to find sites that do what Google says don’t do then finding rankings that make sense. I am in that sticky spot of removing the previous SEO’s backlinks across tons of domains, all-the-while in google’s penalty box for four months. I wish Matt Cutts would pay attention to this! This is happening in ALL niches! and its a problem as it leaves white-hatters with no option but to turn a least a little bit grey, and so the cycle continues. So frustrating! SEO field is a complex field. I just landed here through quicksprout and amazed to see so much information. I am glad to be here and get some valuable information on bad link profile. I am bookmarking this website to come back for more information. To be frank, I think the Google is just Woke up now! I am fairly new to the SEO scene but learning rapidly. I do a lot of research and noticed the same. So many sites are still in the top 3 positions with many spammy links. I try and work out why but cannot.. It doesn’t seem they are getting punished enough? I have thought the same thing for a long time but didn’t have the knowledge or experience to bring it up. Love the post Barrie. You used a great example to illustrate your point. Many clients ask why low quality sites are ranking higher than them, but Google catches on to these sites and their rankings are short lived. It is very hard to build a lot of links in an ethical way. If you have great content and people love it, they will share it and in the end you will get more traffic and links to your site. After Reviewing one of sites that you discussed on backlinks report ! i have found it’s completely hacking as you said ! and this guy have get into Russian server which he was able to find a vulnerable website on the server and then uploading a shell and run one of the local roots and simply he was able to access over the server changing just the links over all those sites 🙂 ! Great post. Advice to be taken to heart. Building quality backlinks takes time and effort. Nothing good comes fast and cheap. This is a nice post which not just describing negative effects of black hat linking but also the way how we should use majestic seo to analyse banklink quality of our website.